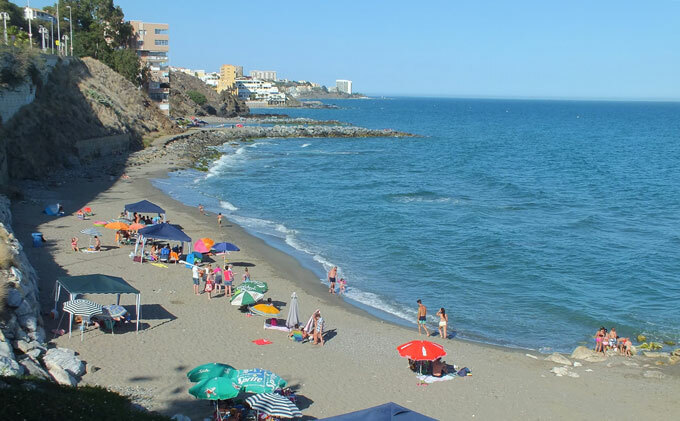 The beaches in Benalmadena stand out for their quality and popularity, although we can find peaceful and natural beaches the further away we go from the city centre. Amongst the repertoire of beaches that we’ll find in Benalmadena, there are also ideal coves exclusively for nudists. It’s worth pointing out that almost all the beaches have large areas of sunbeds and wooden sunshades to hire, although there is always room for those that just prefer to use their towels. Almost all the beaches also have showers and taps to rinse your feet to wash off all the sand, although it’s not always specified in the accesses. Undoubtedly, Benalmadena is a great place to stay if you're looking for great beaches on the Costa del Sol. Location: In Benalmadena Costa, near the Torremuelle area. Services: Easy access for the disabled, bus stop right by the beach and parking. Location: In Benalmadena, between the beaches of Las Yuccas and Arroyo Hondo. Services: Full body showers and taps for the feet, beach bars, easy access for the disabled, sunbeds and sunshades (to hire), red cross, changing rooms, etc.. Description: Only 500 metres long. The water and the surroundings are completely natural. It’s a very popular beach for everyone. Location: In Benalmadena, on the way to Fuengirola, the turnoff straight after Las Viborillas beach. Services: Parking, sunbeds and sunshades to hire, showers, easy access for the disabled, rubbish bins, easy access to the motorway, warning signs, beach bars and restaurants. Description: A very attractive beach for all of those looking for a natural area with crystal-clear water, ideal for scuba diving. Location: Leaving Benalmadena Costa towards Torrequebrada, very near Sunset Beach. Services: Parking, public showers, bay watch, first aid, a playground for the kids, nearby bus stop, easy access for the disabled, nearby hotels, beach bars and restaurants. Description: A very popular beach in summer and during weekends, with plenty of services and grey sand. 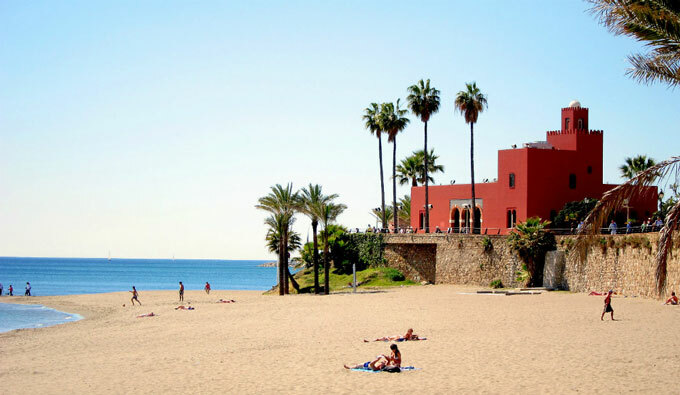 Location: If you’re in Benalmadena you may have heard of the Bil-Bil castle; in any case, to get to this busy beach from Malaga you must take the N-340 road till you reach the Bil-Bil castle, a red Moorish castle situated right in the centre of Benalmadena Costa. The beach extends all along the area and you can park your car in Avenida Federico Garcia Lorca which is situated nearby. Services: With small beach bars where you can taste all kinds of dishes, specially seafood. It has a promenade with shops and bars nearby. It also offers sunbeds with sunshades for those who are willing to pay. 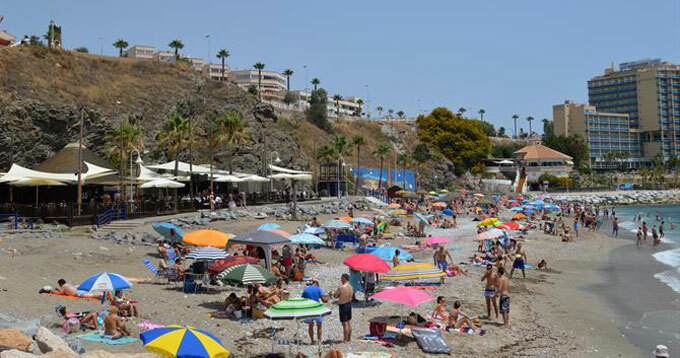 Description: One of the most beautiful beaches in Benalmadena, with fine sand and clean water. It’s very popular in summer, specially amongst the youngsters. Location: This beach is located near the N-340 road in the Triton hotel. Services: There’s a seafront promenade, showers, easy access for the disabled, parking, beach bars, first aid, nearby hotels, bars, a bus stop and taxi rank. Description: Situated between the beaches of Malapesquera and Bil-Bil, Santa Ana is one of the oldest beaches in the area. Location: Almost at the entrance of Benalmadena, take the turnoff towards the port and park wherever you can, the beach is situated by the port’s lateral breakwater. Services: All kinds of services as well as water activities to rent. Description: A popular beach amongst the youngsters, particularly in Summer. Location: Situated by the N-340 in Benalmadena Costa. Services: It’s a nudist beach, with showers, beach bar with gardens, etc.. Description: It has a picnic area nearby and it’s a very popular beach amongst the nudists that visit the Costa del Sol. Location: Situated in Benalmadena Costa. Services: Public showers, vigilance towers, first aid, playgrounds and a seafront promenade. Description: It’s one of the most beautiful beaches on the coast of Benalmadena. Location: If you go by car, take the turnoff towards the Benalmadena port, the Fuente de la Salud beach is the one situated to the west of the port. Services: A seafront promenade with shops and restaurants, plenty of sunbeds and sunshades to hire, showers, easy access for the disabled, tourist information, hotels, beach bars, bars, first aid and water activity rentals like pedal boats. Description: This beach is unique in Benalmadena and the name comes from an old legend that sayis its water has a healing effect. It was a rocky beach in the past, however nowadays it’s sufficiently wide and sandy.